Thermostats can have a dramatic impact on the overall energy use and comfort of your home. See Ductworks Heating & Air Conditioning for a complete line of controls and thermostats—including digital, non-digital, programmable, and non-programmable—from Daikin and Honeywell for easy control over your home’s temperature, humidity, zoning levels, fan speed, and more. We can help you choose the one that best matches your lifestyle and install it. Ask us about the ENVi from Daikin, a DuctWorks Heating and Air Conditioning customer favorite. The ENVi allows you to control the temperature, timing, and more, as well as remind you when it’s time to service your air filter, humidifier pad, UV light, or ventilator. Simple, intuitive, and powerful—this programmable thermostat also offers optional remote access—add an app on your smartphone or other mobile device to control the temperature of your home from anywhere! Think about the days you’ve turned down the heat when you’re away, while wishing you could return to a toasty house instead of waiting for it to warm up. Now that’s possible! Give us a call to learn more about Wi-Fi thermostats. 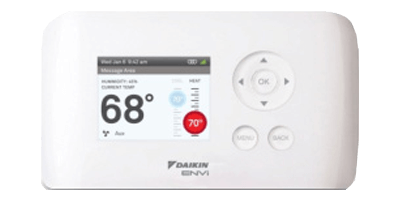 Ask us about creating a customized comfort system with controls and thermostats to enhance your home.